The market system allows players to trade items with each other without having to arrange the trade themselves. 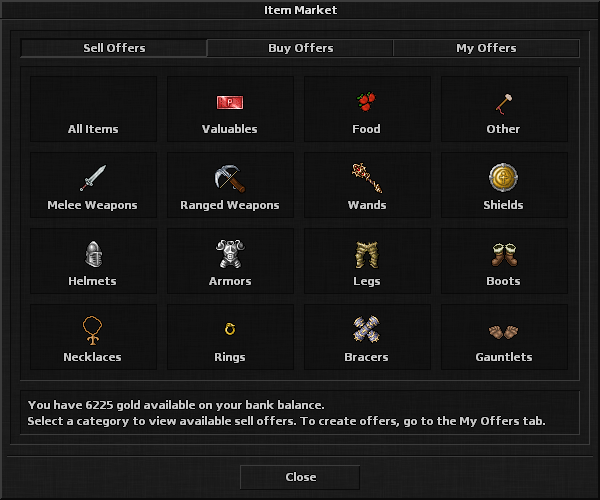 All players on the mainland can place both sell and buy offers for a fixed fee of 50 gold. Offers expire automatically after 14 days and the items are returned to your depot (sell offers) or money to your bank balance (buy offers). Open up the market by saying market to your local market NPC. The current market NPCs are Gertrude (Bersund), Jeff (Ellaria), Lauri (Karkkila), Hakim (Ben Qarassih), Merek (Caerfa), Eduardo (Vevay), Katelyn (Lyedel) and Rose (Gulshan Village). You can sort the offers by for example price by clicking on the column header in the table, and you can also look at items (to see their stats, for example) by holding CTRL and left clicking. To create a Sell Offer (sell an item), go to the My Offers tab and drag & drop your item there. To create a Buy Offer (buy items from other players), go to the My Offers tab and press on Create Buy Offer. Upon offer creation the server will try to automatically match existing sell and buy offers to make immediate trades. You can view a history of your market trades by pressing on the View History button in the My Offers tab.